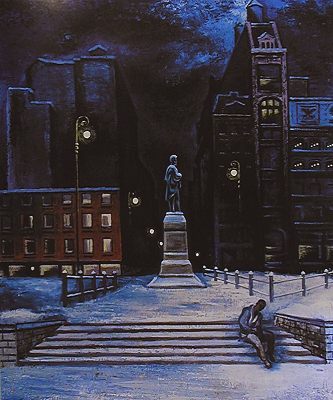 Dimensions: 13 7/8 x 10 3/8 in. Two first state proofs (numbered 1/2 and 2/2 were pulled in 1935. First state impression 1/1 has "elaborate pencil notes by artist and printer," but is not signed and has not been observed by us. (Anyone with knowledge of this impression please contact us.) The other bears the variant title: Lincoln Monument in Union Square and is dated "1935." 1935 impressions -- not state proofs: Apparently there was an intended edition of 50 with an undetermined number of impressions pulled in 1935. Two of these impressions are known, one being the impression at UMMA. "Edition 50 Lincoln Monument Union Square . . . . Ernest Fiene 35"
1936 edition: Evidence exists for an edition of 20 dated 1936. Several impressions numbered "x/20" and otherwise annotated in Fiene's most usual manner have been observed. Inscriptions: An untitled impression dated 1936, is inscribed "To Geo. Miller" [Fiene's printer]. Another impression is inscribed to Lesley and Emma Sheafer. 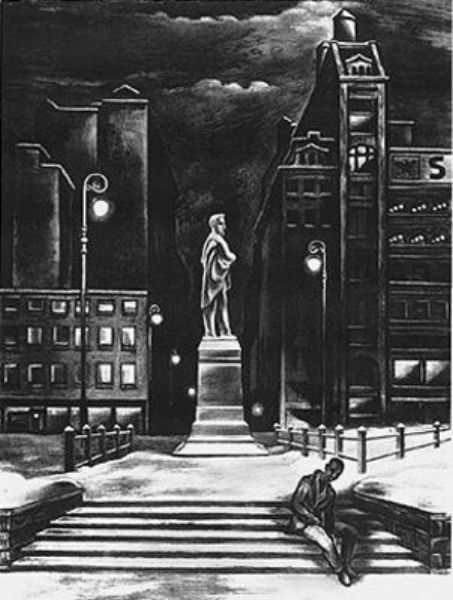 Reproduced in: Between Heaven and Hell Union Square in the 1930s, 39. From the Walter and Lucille Rubin Collection. Photo courtesy of the Boca Raton Museum of Art. 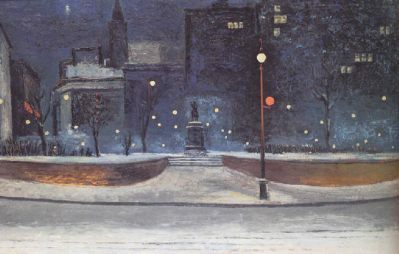 Nocturne Union Square, c. 1935, Oil on Panel, 24.0 x 36.0 in.